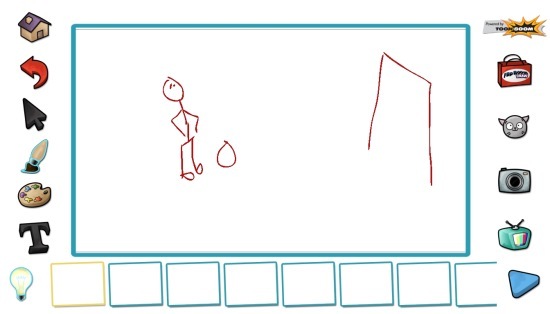 Flip Boom Lite is a free Windows 8 Animation Maker App. You can use it to Doodle, Scribble, and create animations. You have rich number of options available in the app, like adding text, Background, and other useful stuff. What is really impressive about the app, is its ability to create animations. You can create animations using your photos, snaps that you take using your image capturing device, or any scribbled drawing that you have created. What’s more, you even get the ability to save your creations on your local storage. In addition to that, you can share the created animations or pictures using the option for it available in the app itself. Flip Boom Lite is freely available in the Entertainment category of the Windows Store. As you get to the main home screen of this app, you will see the option to make new project, along with the other animations that are available by default in the app. To create new project use that particular option, and you will get to the main drawing canvas where you can make the animations. Let me give a review about the various tools that are present in here. The first one is the home button. The second one (a curved arrow), is the undo button to go back to your previous move. It is the fourth tool, the drawing tool, that consists of brush option, eraser, and the color fill option. The first option that is present in here will let you choose the brush to draw. Use the slider to fix the thickness of the line.The second tool present here would let you to make several lines at a time. The fifth option is that of color fill. For any enclosed figure, if you use this option all the enclosed area will be filled by that color. Choose the color from the fourth tool given in the panel on the left side. Along with that, there is a panel on the right side also, which give the options like sharing. As you use the New project option and land on the drawing canvas, a group of empty frames would be shown on the bottom side. Of them, the first one will be chosen as you open the new project. Now start drawing the first scene of the animation on that page. When you are done, get to the second frame and start drawing the next scene for the animation. Likewise, you have to draw new scene for each frame.After creating all such scenes, use the play option given on the immediate right side of these frames to play the animation. As the animation plays, you would have a slider on the right side from where you can change the speed of the animation.After that, you have to hit the home option given in tool. There will be a new icon created for that animation on home screen of the app, which you can right click on and a bottom flyout will appear. There will be an option to save the animation file on your local storage. It will be saved in .FBD format. The app also gives you the option to share the created animations. For that, you can use the TV like option on the bottom of the right side panel. These shared files can be downloaded in .wmv format which you can play in player like Windows media player. Here is a .gif image of the animation I have created. Include backgrounds into the animations you want to create. With choice for editing . Save and Share your creations with others. In my opinion Flip Boom Lite is a great Windows 8 Animation Maker app when it comes to the number of options it provide for creating animations. It gives option to save, and share animations over the Internet. All in all, it is a great app, and deserves a try.